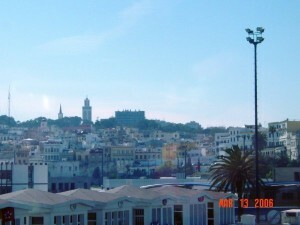 Darkness had long fallen upon the ancient coastal city of Tangier when Llew and I arrived there. I was visibly excited. 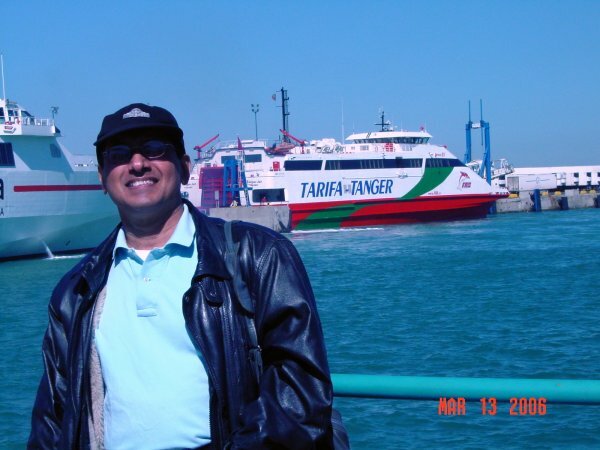 Not only was this my first arrival on African soil, but the distinctly Arab influence was evident on the ferry as we crossed the Straits of Gibralta from Tarifa in Spain. 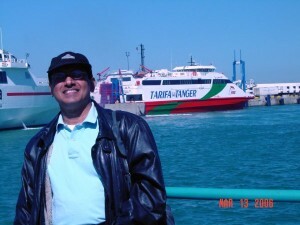 Groups of women dressed in flowing robes and men wearing the traditional fez caps chattered away in Arabic during our voyage to the Barbary Coast. 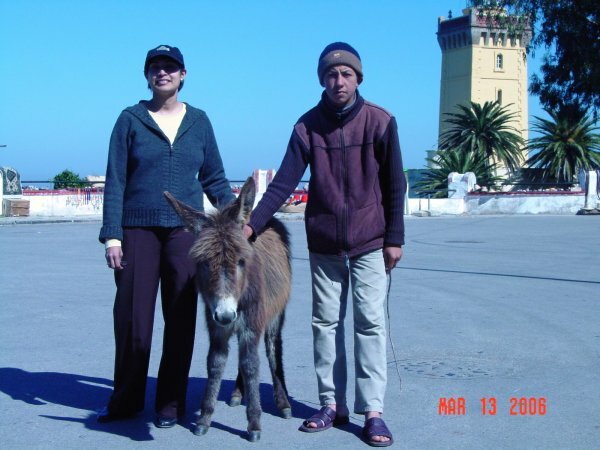 I couldn’t wait to find out what Morocco would offer us. Hotel Continental (left) is a gem of a building situated right in the bustling midst of the ancient Muslim medina or medieval town center. Think of the movie Casablanca, of the sets of the hotel in which Sam played his piano as Bogey sipped his cognac through a haze of cigar smoke. 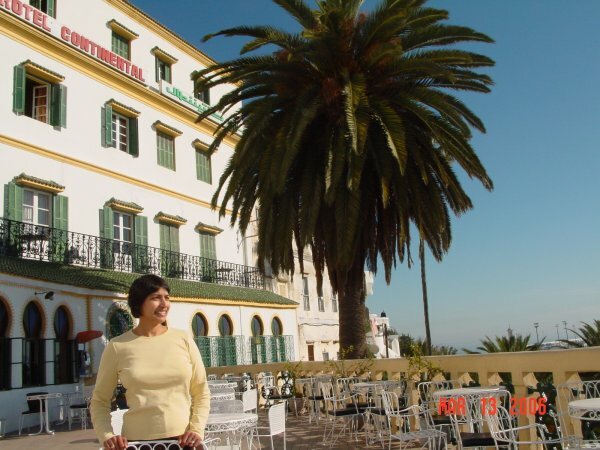 Built in 1865 as a private mansion to house a wealthy Moroccan dignitary, its ownership changed hands several times until it was converted into a hotel. Wide corridors completely covered with ceramic tiles, colored glass lamps, an old grandfather clock and an old grand piano were some of the Euro-Islamic elements that greeted us in the reception foyer. 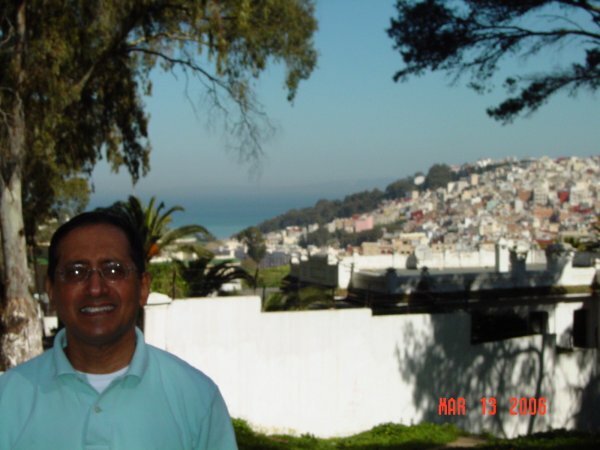 Mohammed, our receptionist, was gracious and dignified as he went through the formalities of registering us. What a delight it was for me to discover that we could speak French to him! After days of dealing with sign language in Spain, I was able to have a very comfortable conversation with him as we talked about breakfast arrangements and the prospect of hiring a private taxi to take us on a sightseeing tour of the city (300 dirhams for 3 hours of sight seeing and the services of a chauffeur-guide). 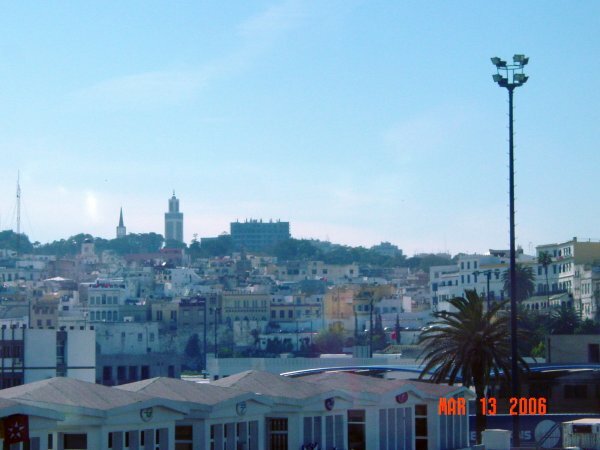 It was with happy anticipation that we looked forward to our travels in Tangier and as we ended another eventful day, we were pleased at the possibilities of what lay ahead. The call of the muezzin as he roused the faithful to prayer from the nearby mosque woke us up twice during the early dawn hours as our hotel were located in the Islamic heart of the medieval city. The next morning, we were served continental breakfast by liveried wait staff in the ornate dining hall of the hotel where mujedar decoration that we easily recognized after our visit to the Al-Hambra Palace in Granada, Spain, was everywhere. As we sipped excellent coffee and munched on pain de chocolat and brioche, light pouring in from a cloudless sky, warmed us as we opted to eat on the sun-drenched terrace with its wrought-iron railings and marble tables. At 9 am sharp, as arranged the previous evening, our chauffeur Mohammed arrived to pick us up from our hotel and take us on a sightseeing tour of the city. Into the bustle of the commercial area (which reminded us very much of Bombay’s Flora Fountain) and the tiny winding alleyways of the casbah (which reminded us of Bombay’s Bhendi Bazaar), we received an immediate insight into the old-world charms of the Moroccan lifestyle. While people went about their business purposefully, there was nothing of the rough and tumble of a hectic pace. Despite the traffic being heavy, it moved in an orderly fashion around the many rotaries. Moroccan’s colonial French influence was evident in the use of the French language on street signs, the uniforms worn by traffic policemen and the solidity of official buildings. Leaving the city behind us, we drove up into the surrounding mountains to Cap Spartel (left) where a lighthouse marked the point of confluence of two great bodies of water: the Mediterranean Sea and the Atlantic Ocean. At Café Haffa, we were able to look out upon the blue waters of the sea as far as the shores of Spain that lay just across Tangier Bay. 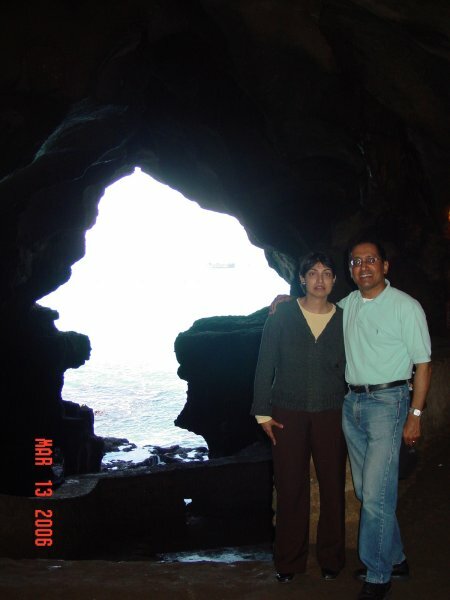 One of the most famous sites for tourists is the Grotte D’Hercule or Hercules’ Cave, a natural rock formation whose granite sides were used for centuries to make millstones to grind wheat and olives for oil. The far end of the rock intriguingly forms the perfect silhouette of the map of Africa (below right). A huge treat awaited us at the cliffs whose sides plunged sharply down to the Atlantic Ocean. Camels tethered to stakes waited patiently to take visitors for a lazy romp along the sandy promontory that jutted out into the water. A bit unnerved at first, Llew and I soon eased ourselves into the thrills of the unusual experience. The most scary parts were the mounting and dismounting as camels have a strange way of lurching forward and back as they raise their tall bulk off the ground. A few minutes into our ride, once we were calmed by the rhythmic motion of the aminal’s ungainly movements, we actually began to enjoy it (below left). Mohammed then drove us back to the city past the main mosque whose minaret rose high above the city, completely covered with faiance tiles in a very bright and vivid geometric pattern. 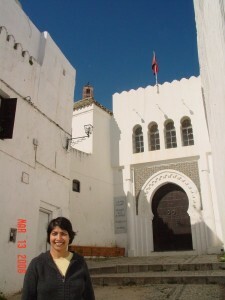 In the casbah, whose walls were blindingly white washed to deflect the dazzling Mediterranean sun, we saw the Casbah Museum (below left). In all of these locales, time seemed to have stood still. We could have been in the 8th century. Mohammed even included a camel ride that took us to the very edge of a rocky promontory that dipped down sharply into the Atlantic Ocean. What an interesting experience that was! Then, we drove through “California” (above right), the more recently developed part of the city where the elite and the affluent have congregated on the hillsides and built mansions that face the azure waters. New beach resorts are mushrooming all over the city as developers take advantage of tourist desires for sandy beaches and relaxing waters. We loved Morocco and its mélange of old and new. 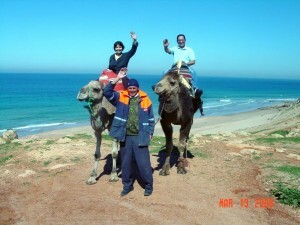 Camels still play in the desert but phones and digital cameras were everywhere—Morocco has entered the Modern Era all right, but it retains its magical medieval charm and its headiness casts a strange spell upon you. We enjoyed every minute of our time in Tangier and were only sorry that our visit was so short. Though we made one brave attempt to get the mid-afternoon ferry, we missed it by a hair’s breath (above) and had to sit out the three hours till the next one left. 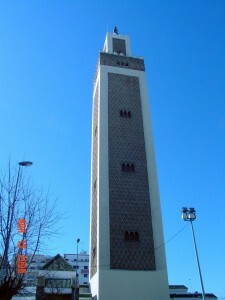 Finding lunches of barbecued meats and yoghurt sauced salads in the port’s cafetaria, we passed our time observing our companions as the city of Tangier lay just beyond us, its colorful minaret rising high into the sky (below). When we did arrive back in Spain, we lost no time picking up our car from the car park in Tarifa and driving north to the bull-fighting city of Seville which lies on the banks of the River Guadalquivir.